In a phone chat, Brown told me the emphasis on art and the experience of interacting with it is what’s going to make the festival unique. The underlying theme throughout all the art seems to be interaction, toying with the way typical music festivalgoers can be active participants in their own experience. But the curators want it to be much more than that. With interactive art being such a integral part of the whole festival, the art side is where Eaux Claires becomes an experience, becomes a community. The success or failure of the festival is in the hands of its curators. 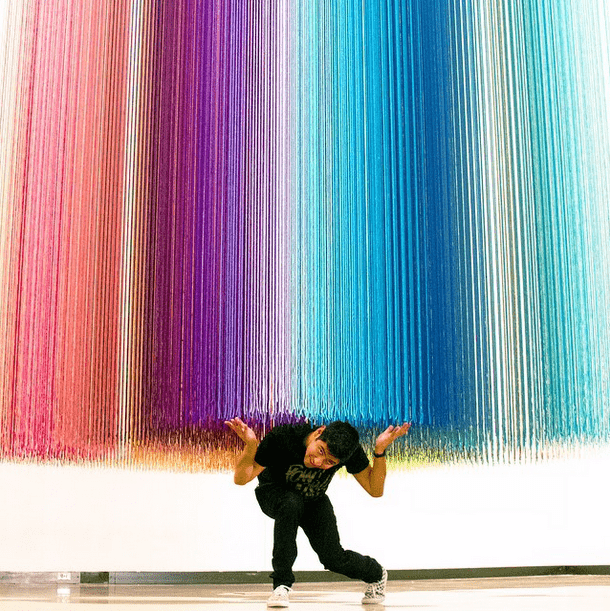 For example, as you first enter the festival grounds, you’ll walk through a massive rainbow-colored yarn installation, courtesy of Minneapolis street artist HOTTEA (above), who’s known for splashing colored yarn in the form of words and shapes on light poles, sidewalks, and streets all over the Midwest. As you continue, you might wander through the woods up to the St. Coix Village (that’s not a typo), a venue within a venue that will host multiple performance spaces including a larger performance tent and three geodesic domes that act as art installations inside the village. Each part of the St. Coix village – pronounced “kwah” – takes its name from a section of the fictitious St Coix “river.” The performance tent is called The Dells, and it’ll host some of the more eclectic musical acts from the festival’s lineup. The Mouth, one of the domes, will house one-on-one performance art from Minneapolis hip-hop artist Astronautalis and Minneapolis visual artist Neal Perbix. The Channel, the second dome, is a partnership between brownshoesonly and Radioedit (Chicago visual artists) and Eau Claire-based pedal-makers Dwarfcraft Devices. The final dome, The Banks, is collaboration between Michael Brown and UW-Eau Claire where festivalgoers can experience a live performance by viewing artists through translucent video elements and closed audio transmission via wireless headsets in a 270-degree environment. In 2014, The National collaborated with Icelandic performance artist Ragnar Kjartansson for “A Lot of Sorrow” – where the band performed their song “Sorrow” over and over for six hours. Band members and Kjartansson will come together again for the Eaux Claires festival. 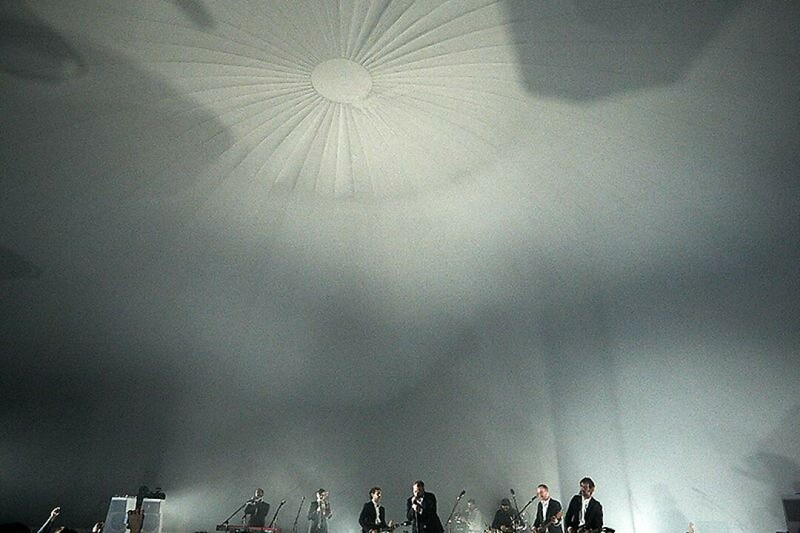 Last year, you might remember The National collaborated on a video piece with Icelandic performance artist Ragnar Kjartansson for “A Lot of Sorrow” – where The National performed their song “Sorrow” over and over for six hours at the MoMa’s PS1 performance space. This year, Eaux Claires – along with the New York-based Luhring Augustine Gallery – commissioned a new collaborative piece from Kjartansson, The National’s Aaron and Bryce Dessner, and Gyða and Kristín Anna Valtýsdóttir (formerly of the Icelandic band múm) to debut at the festival. It would be fair to expect some sort of amazing, endurance-based performance art from this crew. Jon Mueller, of Volcano Choir, will be debuting his new album at the festival called INITIATION, but there won’t be any CDs or records or anything. Instead, the recordings will be presented at each venue with video projection and live dance, the idea being that each performance venue becomes its own non-reproducible media format. Using the Minneapolis-based mobile app, LEAV, festivalgoers will be able to unlock different audio clips as they walk around the festival grounds to reveal different sounds and moments from Bryce Dessner’s classical album Music for Wood And Strings. LEAV also helps expand the role of Michael Perry, the festival’s official narrator with geotagged audio, literally narrating your specific location within the festival grounds. “If you’re on the Chippewa River, it’ll unlock audio that’s only available when you’re on the Chippewa River, and it’ll be a poem by Mike Perry about the Chippewa River,” Brown explained. And if that’s not enough, Brown and Brooklyn artist Karl Jensen are creating sculptural light installations that re-think and manipulate the festival grounds and signage. There will literally be art everywhere you turn. With such a stunning emphasis on experiential art, Eaux Claires is not only aiming to be filled with great music and beer-drinkin’ like all the other festivals, but it’s going to set itself apart as a transformative art experience from the second you set foot there.